DRAFT ANALYSIS: "A versatile, speedy player of great character who finds the football and works hard defensively." After overcoming a serious ankle injury that ended his season in 2017, Jones responded positively with several encouraging performances for the Tassie Mariners and the Allies this season. He’s one the most promising prospects out of Tasmania this years’ draft and looms as a possible first-round contender. He’s a clean ball user, with electric speed and fantastic lateral movement. He can win the ball on the inside and outside of the contest and his tackling has been one the highlights of his game. His character and personality have been noted as one of his biggest strengths and this was clear when he was given the honour of captaining both the Marines and Allies this season, signifying his leadership potential. Jones was also awarded All-Australian honours for his terrific efforts in the AFL U18 National Championships. Jones is a natural ball-winner who can win possession on the inside and outside of the contest. He’s got several noticeable strengths such as his outstanding work-rate, his repeated efforts, his ability to runs both ways and his constant pressure around the contest. He’s a handy ball user, who can kick on both sides of his body, which is a must-have for midfielders in the modern era. Jones has the speed and agility required to weave through congestion at stoppages, along with the toughness and mindset to apply tackles when needed. He recorded an 8.270-second agility test score further showing how quick he is on the move. He is a fearless competitor and he isn’t afraid to put his head over the ball on a continuous basis. This was evident during the National Championships when he averaged over six tackles a match. He caught the eye of many on-lookers during the carnival, especially in his teams’ win against Vic Country when he amassed 28 disposals (16 contested), five marks, six tackles, five clearance and two goals in a scintillating performance. Jones’s character and personality have been praised by many, with his professionalism and willingness to help his teammates, adding another important attribute to his long list of positives. His competitiveness, stoppage work, leadership qualities and scoreboard impact will definitely boost the likelihood of Jones’ ending up as a possible first-round selection come November. 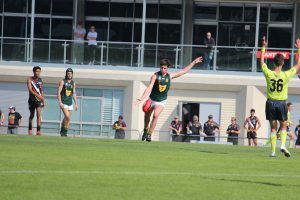 At 180cm and 74kg, he is not the bulkiest of midfielders in the draft, and his lack of size at the moment may be hard for him to compete with the big bodies at AFL level, even though he has been competing against men in the Tasmanian State League. But with his speed and impressive lateral movement, I see Jones as more of an outside midfielder, who can play on the inside if needed, mainly due to his willingness to put his head over the ball. While he may be one of the better kicks in this years’ draft, Jones will continue to work on his decision-making and ability to lower the eyes, particularly when delivering the ball to teammates in the forward half of the ground. There were just a number of instances where he threw the ball on the boot without always having a look, but this is something that will come with knowing his ability at the level and being able to find that time and space to deliver cleanly like he is capable of doing. Jones is still firming as possible first round selection, after an eye-catching National Under 18 Championships. His performances in the Tasmanian State League have also been encouraging, with the classy midfielder averaging 23.3 disposals, 8.3 clearances and 6.6 tackles over seven games this season. The goal-kicking midfielder definitely possesses plenty of promising qualities that many AFL clubs will be eager to develop. He is a potential future captain with high-level speed, agility, defensive pressure and scoreboard pressure.